The memorial to the Resistance at Rouffillac on the D703. It was here on 8th June that Adolf Diekmann's men in the vanguard of Das Reich came into contact with members of the Resistance as they motored down the D703 from Carsac to Souillac. The Resistance had placed a large barricade across the road at this point and there was a brief exchange of fire. According to the Resistance they killed at least one German and damaged an armoured car, loosing one of their own men in the fight. The memorial is not just to members of the Resistance (the first two names), but to all persons from the local townships that died on 8th June. Visible to the left of the column is a plaque giving more detail of the events and misspelling the officer in charge of the SS as "Dickmann" instead of Diekmann. 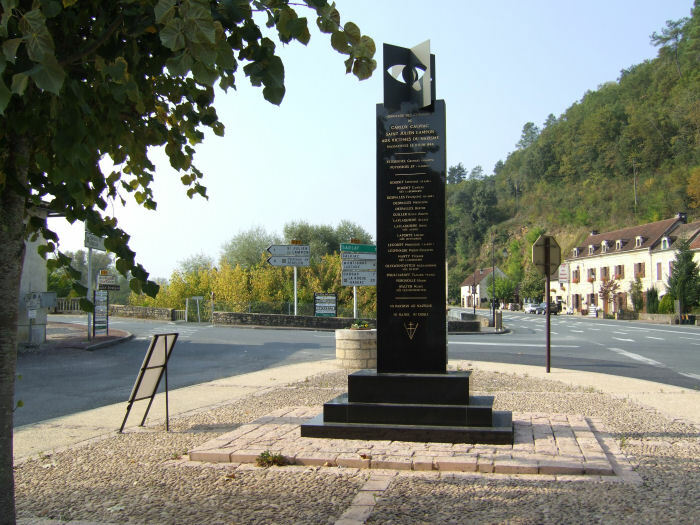 The inscription reads, "Tribute of the townships of Carlux Calviac, Saint Julien Lampon to the victims of Nazism butchered on 8 June 1944. Georges Estournel (Resistance), J.P. Puydebois (Resistance), Lucienne Boudet (11 years), Camille Boudet (nee Laborderie), Francoise Despalles (11 years), Micheline Despalles, Berthe Despalles, Emile Joseph Despalles, Alexis Laflaquiere, Anne Laflquiere (nee Auriel), Louise Laporte (nee Meynarde), Micheline Lecourt (11 years), Pierre Cilestin Lespinasse, Yvonne Marty (nee Laborderie), Alexandrine Oleochnovitch (nee Zilzeff), Tamara Poukliakoff (9 years), Henri Vergnolle, Marie Walter (nee Oleochnovitch). No pardon to Nazism. Nor hatred, nor forgetting." Note that 4 of those killed were children. Note: The names above have their spellings taken from the memorial itself, but I have been told by a family member that the correct spelling for two of the names is "Olechnovitch" and "Poukhliakoff". The miss-spelling of names on memorials is unfortunate, but quite common. There is a bridge over the Dordogne to the left of view, but on this occasion it was not used by the Germans to cross the river.